..Says construction of 3,000 capacity truck terminal ready soon. Apparently, overwhelmed by the current traffic gridlock in Apapa and environs, Governor Akinwunmi Ambode has made a passionate appeal to the Military and other security agencies in the state to support the state’s government efforts in ending the perennial traffic gridlock. The Governor said the reason why he has not ordered the immediate removal of trucks and trailers from Apapa expressway and environs was because there is no alternative space provided for parks. Ambode who made the appeal during the second quarter 2018 Town Hall Meeting, 11th in the series in Apapa Amusement Park, Lagos, added that in the meantime, the state government has secured a space for truck terminal in Ijora area of the state to accommodate about 3,000 trucks. He said once completed soon, there would be total enforcement on the removal of tankers and trucks parked indiscriminately on the way. 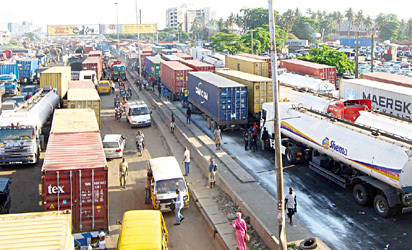 There seem to be no respite in sight over the traffic gridlock along Oshodi- Apapa Expressway and Apapa-Ijora road due to nefarious activities by truck drivers who have continued to hold sway, shutting down traffic completely, paralysing commercial activities in the area. Several efforts by the state government to address the traffic menace achieved little or no positive effect as the entire environs remain impassable mainly to the illegal and unruly activities of thousands of articulated truck drivers who throng the axis on daily basis for products and port activities. The chaotic situation had worsened in recent time as there was complete shut down of the roads by truck drivers. Speaking to the large audience that thronged the venue of Town Hall Meeting, Tuesday, Ambode admitted that the unusual seamless traffic situation he experienced on his way was cosmetic and therefore, urged security agencies to try and maintain sanity in the area henceforth, pending the completion of the ongoing construction of Ijora truck terminal. According to Ambode, “I noticed that instead of spending three hours, you (residents) normally experience on the road, I actually spent few minutes getting here. I hope the security agencies, including the Military will maintain the situation. “I have decided to come to Apapa to have the first hand of traffic situation. I can assure you that the real life in Apapa will come back before the end of this year. “I therefore call on security agencies to assist us in putting an end to this traffic situation in Apapa. Lets bring our resources together to solve the traffic situation in Apapa. We must find a way to check the menace of trailers. The post Apapa gridlock: Why I have not removed tankers from Expressway- Ambode appeared first on Vanguard News.